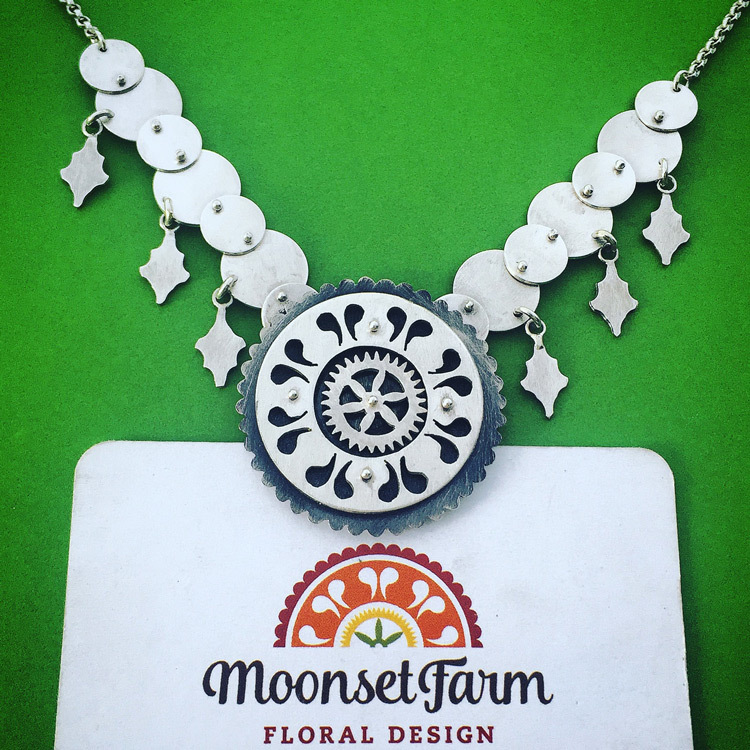 Necklace with decorative chain and center design to match business card logo. Center of the design spins. 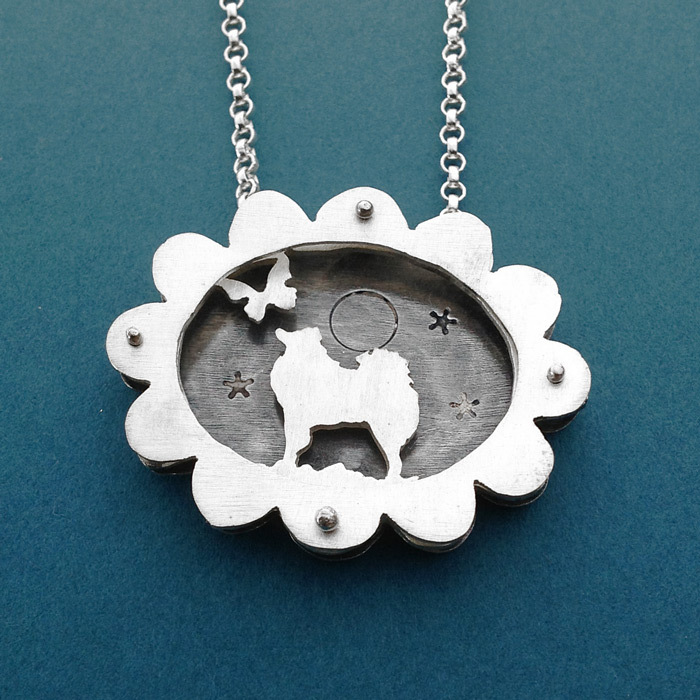 Five layer, two sided small etched shadowbox necklace featuring silhouettes of children. Extra large four layer shadowbox necklace with spinning dolphin. Cufflinks with Where the Wild Things Are imagery. Large circle shadowbox necklace with 10k gold griffin as center design and gold fill chain. Small Etched Shadowbox with Pomeranian dog. Large Circle Shadowbox golf ball and tee necklace. Large scalloped shadowbox necklace with lotus flower. 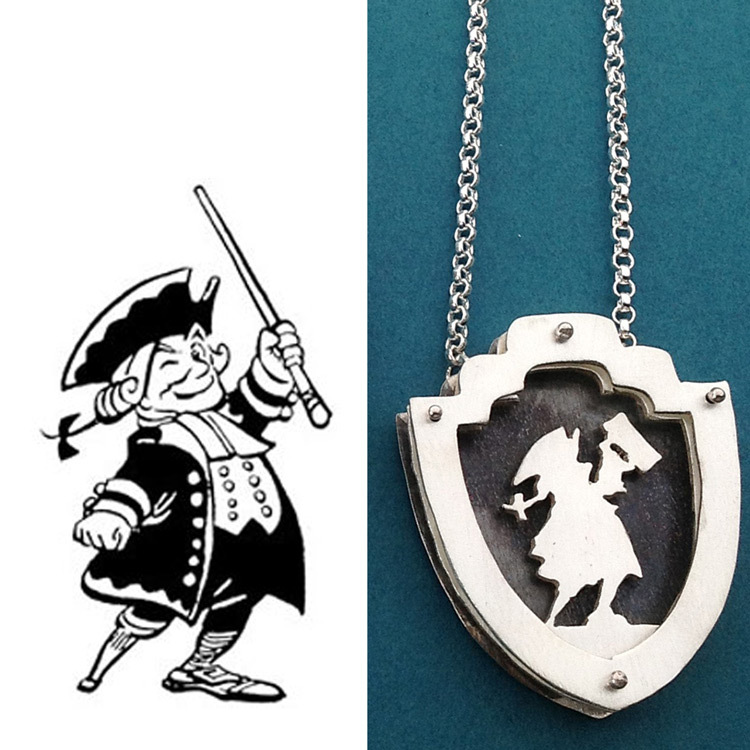 Ornate shadowbox necklace with silhouette of children. Jewelry brand created for Preservation Hall. Available to purchase HERE. Set of two hand stamped sterling silver bangles with song lyrics. Large circle shadowbox necklace with Canadian maple leaf. Collection designed for the Lemur Conservation Foundation. To see their mission & foundation information, go to www.lemurreserve.org. To order this necklace, visit their shop on Amazon. Ornate shadowbox necklace with wedding invitation logo design. Large Scallop Shadowbox dog & butterfly for BT Thomas. Small scalloped shadowbox necklace with swallow. Ornate shadowbox necklace with silhouettes of children. 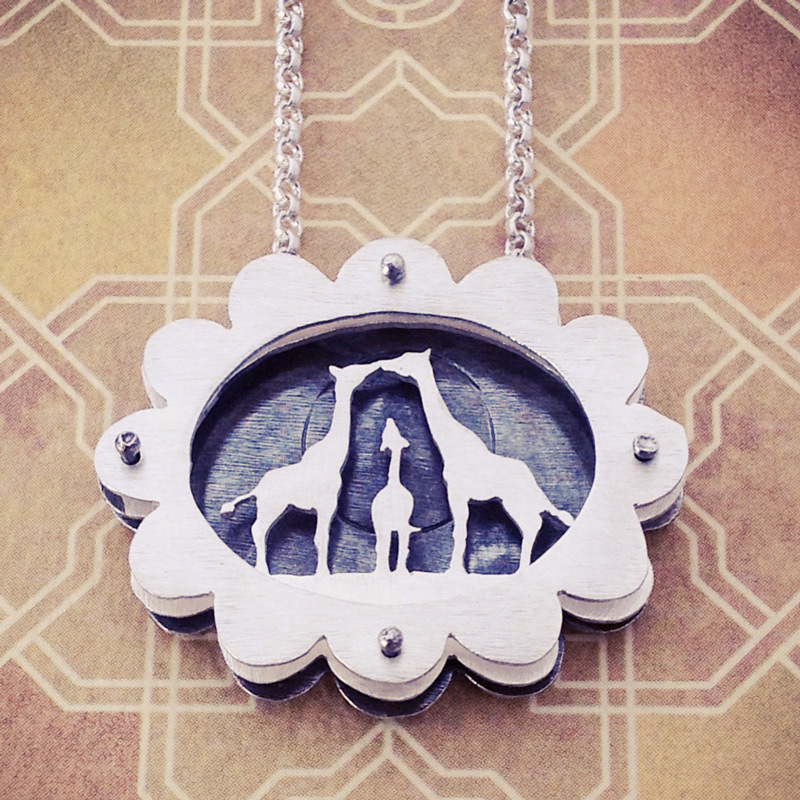 Large scalloped shadowbox necklace with giraffe family for expecting mother-to-be. Gift set of three hand stamped sterling silver bangles. One with song lyrics, one with geometric design and one with braille coding. Large circle shadowbox necklace of two girls holding hands. Nickle belt buckle with Molly's at the Market logo for Trey Monahan. Nickle ornament with stacked sterling disc and stamped initials. Sterling silver cufflinks with honey badger for BT Thomas. Large etched shadowbox necklace with lizard on a tree limb for Sue Foster. Cuff links with Aries and Taurus for a collector with cusp zodiac sign. Large Circle Shadowbox design with artwork from logo. Heraldic Shadowbox using collegiate logo with alternative design option to hold beer stein in hand. Large scalloped shadowbox necklace with scarab and sterling wings. Large scalloped shadowbox necklace with Molly's at the Market logo. Over-sized sterling silver hand stamped tie bar for Mr. Singer of Sharp Cookies. Nickle belt buckle wedding gift with initial for Danielle Berner. Matching sterling silver fish wedding bands. Please send an e-mail if you are interested in having a custom design made.